The fact that they took down all the banners that students had put up and replaced them with a “Big Game Bonfire Rally!” poster is not exactly the greatest crime in the world. But the contrast is clarifying. It demonstrates how the university thinks about the kind of speech which is appropriate for the steps that — as Rachel Maddow brilliantly shows here, using archive footage and sound — are, actually, literally, the Mario Savio steps. 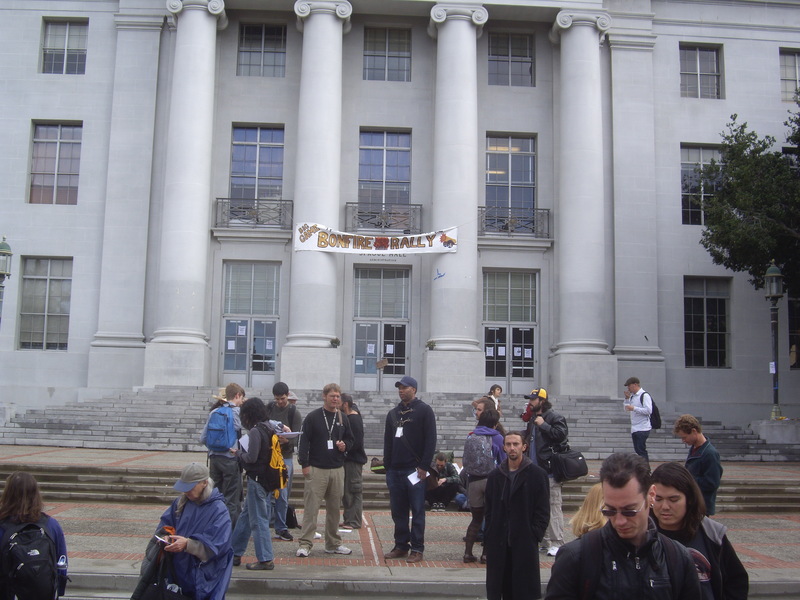 They are actually the steps named after Mario Savio, the great orator and organizer of the Free Speech movement. It is above these steps that the university took down one set of banners and put up another, a different kind of banner of which they approved. This sign was on top of the MLK memorial building, looking down onto Upper Sproul where thousands of students were rallying, for public education and many other things. 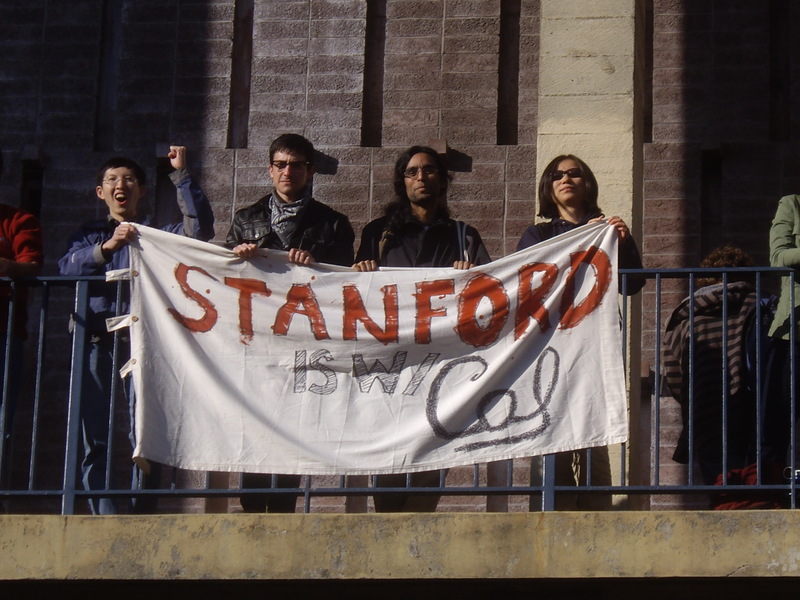 These students had to strictly abide by a set of rules on protesting that said they could not have banners or signs larger than 30 x 30 inches, tarps that could be used to entangle police officers, or, basically, any kind of sign that could conceivably be used as a weapon. I know this because @millicentsomer was quizzing some police officers about it — after some law students got hassled for having suspicious signs — and this and this was what they told her. It was very important to make sure that students not have signs which could be converted into weapons for attacking riot cops, who would thereby be rendered defenseless and helpless. Stanford’s mascot is a tree or something, so let’s be clear about what’s happening here: we are being reminded that football is about destroying the students at Stanford — symbolically chopping their bodies up — and that we hate them, because we are on different sides of A Very Big Game. I presume that the bonfire rally involves some kind of symbolic immolation of trees marked “Stanford” or something equally stupid. 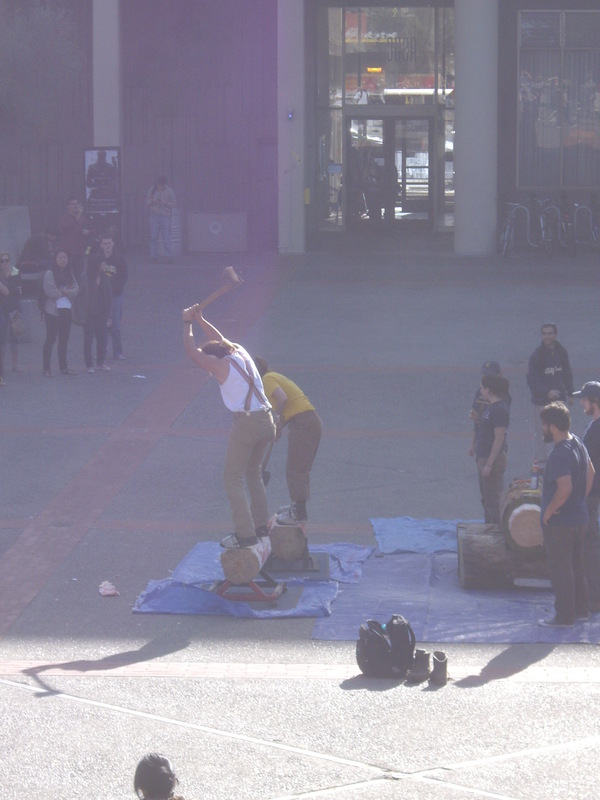 This is the kind of demonstration the university likes, and the kind of situation in which it has very different regulations for what kinds of objects may be carried and used, what kinds of objects may become dangerous. Some kinds of symbolic actions are encouraged, while others are carefully policed. What this article fails to mention is that the people with the axes are members of the Cal Logging Team. They’re not just some random students with axes. Very cool. Thanks for taking the time to share! I used to try to go to two chrheucs on Sundays and sometimes during the week. With two young kids now, I usually am lucky if we make it through one entire service. Listening in the car or at night while doing other work is a great alternative Thanks again! I’m imesserpd. You’ve really raised the bar with that. I litalelry jumped out of my chair and danced after reading this! You really should do your research before you decide to try to prove (or passively assert) an argument with invalid points. 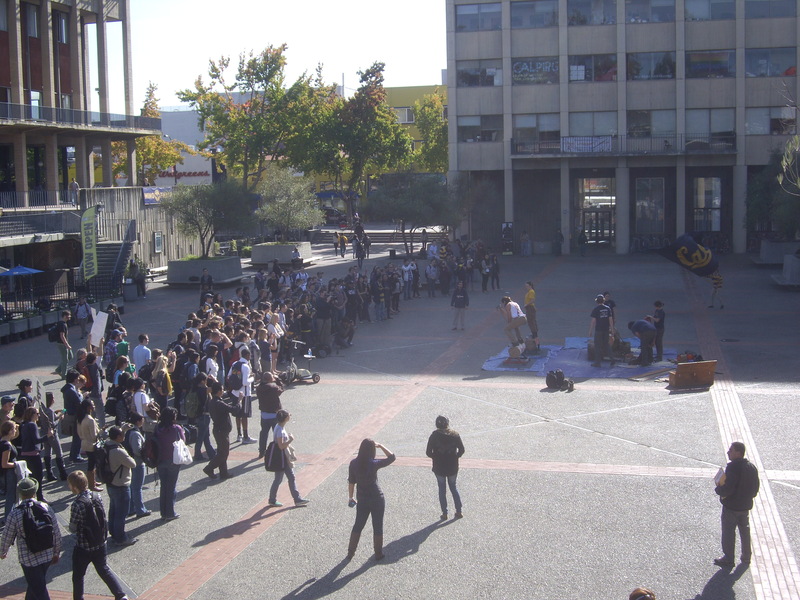 First of all, the reason that the people on Lower Sproul were allowed to use weapons was because the people who put on this rally literally have been planning and alerting the school (and police) since the beginning of the semester. They went through the appropriate channels, obtained the permits, and paid the money. The people handling the axes were on the Cal logging team and work with such tools often. They were not people driven by dissatisfaction, revenge, or protest. Secondly, Big Game Week (and the rivalry) are not about hating and killing Stanford. Let’s face it, we all know we are most likely going to lose. Big Game Week is about instilling a sense of pride in the university, spreading love for the area, and uniting students together in appreciation of public education. It’s not about a football game or a rivalry- but I doubt that you would understand that, considering you do not appear to be a Cal student. Thirdly, the University was not in charge of producing the banners. While they did remove the installation pieces on Sproul (and the protestors banners), they did not create the Big Game Week banners. That was a student group on campus who (again) have had the permission of the university to place such signs for a long time. Honestly, you should feel ashamed of yourself. You sit here, writing a passive aggressive piece bashing what you presume to be the University, while in truth you are attacking a student group. Every year, without fail, the members of this group spend a majority of their time attempting to spread appreciation and love for this school and its education. All they really want to do is to unite the school, like the protestors. There are differences of course, as a group funded by the school they work within the university’s laws, going through the appropriate channels, requesting permits, and paying the necessary fees. Preparation for their events takes months, forgive them for wanting to be able to put on the events that they’ve devoted so much time and energy to. Just because they have a different way of doing things does not make them the opposite of the protestors you seem to be biased towards. Finally, I urge you to consider learning how to present both views of an argument. You have the ability to educate the masses through the media, but it isn’t education if you (and your readers) do not hear and understand all the points of view. I am a student, a graduate student. Unlike you, I use my name here, so you can verify that if you like. And yes, I am biased towards the protesters. But my point was a simple one: the university has one set of rules for people whose demonstrations put forward a set of messages it approves of, and another set of rules for those whose activities it does not. The university took down one set of student banners and allowed other banners to be put up. You can certainly disagree with me about the propriety of that. But all this business about shame and research is silly. I’m not talking about the students who put on the big game demonstrations; I’m talking about the way the university regulates speech by having different rules for different sets of protesters. And it’s also not a requirement for me to put forward anyone’s opinion but my own on this blog. You’re free to put forward yours, in the comment section here or on your own blog. The University operated on one set of rules for both cases; the difference is the ones with a permit were allowed to proceed. These rallies are not spur of the moment circle-jerk hate fests. These are planned months in advance. 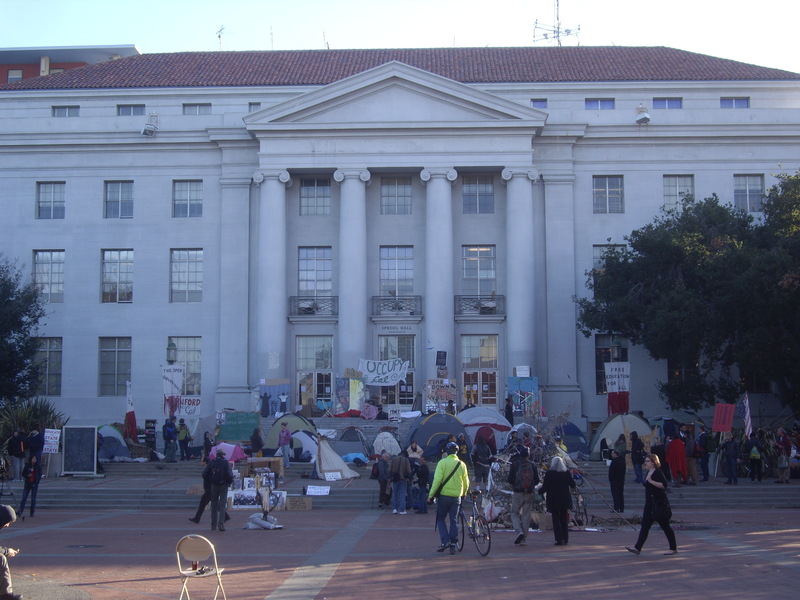 I support the Occupy Cal movement but I don’t agree that every other group on campus should drop all of their business for the sake of protest. The Bonfire Rally people should be able to put up their sign that they got permission to put up without Occupy hogging all the attention. As a member of the band I can say that we work hard for these events and they deserve to be allowed their fair share of room to operate.